Does Your Employer Classify You As An Independent Contractor And Deny You Overtime? Does your employer call you an “independent contractor” but treat you like an employee? If so, you could be entitled to overtime. Under the Fair Labor Standards Act (“FLSA”), employers are not required to pay independent contractors time and a half for overtime. However, employers routinely misclassify workers as independent contractors as opposed to employees to cut down on overtime pay. This is against the law. So-called independent contractors who are actually employees are entitled to overtime pay at a rate of one and a half times their regular rate of pay for all hours over 40 in a workweek. (1) whether the worker’s services are an integral part of the business or does the worker perform one separate discrete job? (2) whether the worker has worked for the employer for a period of time, i.e. is the worker essentially a permanent worker or someone who just comes in to work a few jobs when needed each year? (3) whether the worker or the employer is in charge of covering the costs of the tools, equipment, materials, etc. (4) whether the company controls the worker’s job, hours worked, pay rate, etc. (5) whether the worker has the opportunity for profit or loss, i.e. can the worker earn more by working more efficiently or is the pay a set amount regardless of how the job is performed? (6)whether the job requires a certain level of skill or do the tasks require little training? (7) whether the worker is in the open market competition for jobs, i.e. does the worker advertise his own business? Does the worker have other customers in addition to the company? (8) whether there is a written agreement between the parties, i.e. an independent contractor agreement? Many people believe that if an employer provides a worker a Form 1099 for tax purposes, then the worker is an independent contractor. However, this is not the case. Simply providing a Form 1099 to workers does not mean the worker is not an employee entitled to overtime. 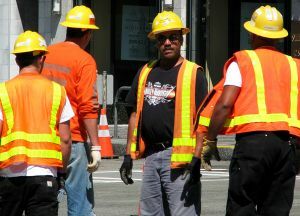 The courts will look at the actual relationship going through the Supreme Court factors above to make a case by case analysis of whether the worker is an independent contractor or an employee entitled to overtime.